The Earthen Ring Quartermaster is as elusive as a long-beaked echidna, so how do you find him in World of WarCraft: Cataclysm? 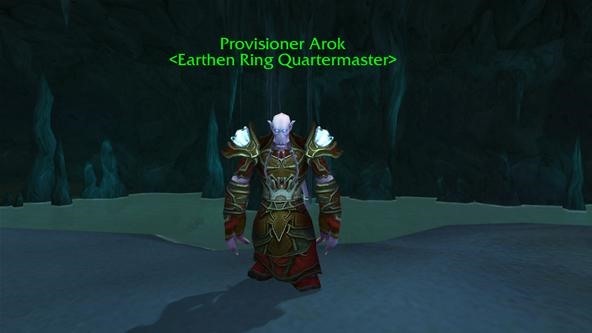 Provisioner Arok is snuggled deep within Vashj'ir zone, in the Shimmering Expanse, resting in the Earthen Ring's respite— Silver Tide Hollow (under water cave). But knowing all of that, Quartermaster Arok is still a tricky one to find. 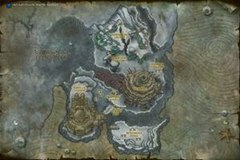 The Earthen Ring is responsible for preserving the world after the disaster caused by Deathwing's exit from Deepholm. His breakout from the Elemental Plane has shattered the World Pillar that bore the weight of all magnetic and elemental forces there, and all of Deepholm would collapse into Azeroth if left unchecked. Several members of the organization are also involved in the unfolding events in Vashj'ir. Their task is to protect the Abyssal Maw and aid the servants of Neptulon in their war against the Naga. But for some reason, they don't have much to say on Provisioner Arok. If you're having trouble finding the Earthen Ring Quartermaster in WoW: Cataclysm, you might find this video Reputation Guide from The Cynical Brit helpful. You'll see where all the known reputation vendors in Cataclysm are (and how to find them), along with the gear available from them. For the Earthen Ring Quartermaster, skip to 7:00. Thanks! It's a good idea to do the first few quests in Vash'jir first. That way you'll gain the ability to breath underwater first. You'll also be able to get the seahorse mount, making it a lot easier to find the way to him under water.